These example termination letters notify an employee of his employment termination because of attendance problems. Use these termination letters as an example when you write your own termination letters. 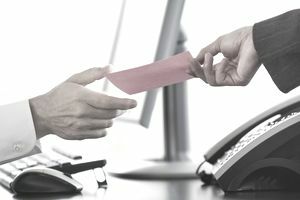 You can send a termination letter to the employee following the termination meeting with return receipt requested, or you can hand the letter to the employee at the end of the meeting. It should be printed on company stationery with the official signature of the employee's manager. Under normal circumstances, the manager or supervisor and a representative from Human Resources will hold the termination meeting with the employee. This meeting to terminate the employee for cause should occur as soon as the organization has the information, documentation, and proof necessary to fire the employee. The letter of termination summarizes what was said at the meeting. This is a sample termination letter for a cause. You can download the termination letter template (compatible with Google Docs and Word Online) or see below for more examples. This letter confirms the actions taken at our meeting today. Your employment with Martin-Spencer Manufacturing is terminated because of your attendance, effective immediately. Your employment, as discussed during the termination meeting, is terminated because your attendance violates company expectations and policies. You have received three prior written warnings, that you signed and acknowledged. These warnings are in your personnel file. You have also been counseled repeatedly by your supervisor and given unpaid days off of work per our progressive discipline practices. At this point in time, you have missed 20 more days of work than your accrued PTO allows which has severely affected our shipping schedule and customers. You were offered an unpaid leave of absence which you refused. We also offered to make accommodations if there were circumstances affecting your attendance. You refused any accommodation. You have received your final paycheck* at the termination meeting. We have also received your gate entry card and your company supplied equipment. You have cleaned out your locker and should have no more personal items on our premises. You will receive a letter from Human Resources with your final benefits information including the opportunity to extend your group health insurance through the Consolidated Omnibus Budget Reconciliation Act (COBRA). Please keep the company informed of your contact information so that we are able to provide the information you may need in the future such as your W-2 form. Here is a second example of an employee letter that terminates the employee's job because of her attendance. In this sample letter, the employees' late arrivals are putting production in jeopardy. We met with you today to have one final discussion about the difficulty that you have demonstrated in getting to work on time. Your manager and I are disappointed that you saw no possibility that you would be able to improve your attendance. On a manufacturing assembly line like ours, there is no way to produce our products unless every station is manned. Each subsequent station must receive the product from the prior station. When you are late, we have to ask another employee to work two stations. This cuts our assembly line production and forces our customers to wait for their products. We have held two earlier discussions with you that were both followed up with a written warning. On both of those occasions, you said that you'd try to do better. This has not happened. You've been late to work four days in the past two weeks. We also inquired about any possible problems that could be contributing to your tardiness and you told us there were no problems to share. You will receive your final paycheck* on the normal payday, next Friday. You can pick it up or we can mail it to your home on request. We collected your gate entry card at the termination meeting. Following our meeting, you cleaned out your locker and so you should have no more personal items on our premises. You will receive a letter from the Human Resources department with your final benefits information including the opportunity to extend your group health insurance through the Consolidated Omnibus Budget Reconciliation Act (COBRA). Please keep Human Resources informed of your contact information so that we are able to provide the information that you may need in the future such as your W-2 Form and your COBRA letter. *Please note that laws regarding the final paycheck may vary from state to state and country to country so make sure that you are up-to-date on those appropriate to your location. Please note that Susan makes every effort to offer accurate, common-sense, ethical Human Resources management, employer, and workplace advice on this website, but she is not an attorney, and the content on the site is not to be construed as legal advice. The site has a world-wide audience and employment laws and regulations vary from state to state and country to country, so the site cannot be definitive on all of them for your workplace. When in doubt, always seek legal counsel. The information on the site is provided for guidance only, never as legal advice.